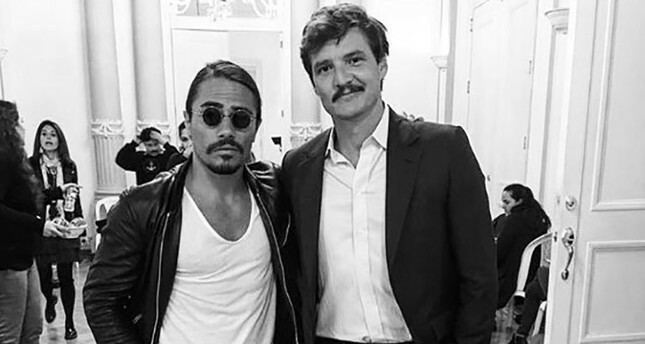 Nusret Gökçe aka 'Salt Bae', the Turkish butcher who became an internet phenomenon after posting Instagram videos showing him slicing meat and seasoning it with salt went viral, has played a guest role in the popular Netflix series Narcos. Narcos, which is set and filmed in Colombia, tells the story of drug lord Pablo Escobar, who became a billionaire producing and distributing cocaine, in season one and two. The third season will focus on the Medellin cartel. Gökçe served meat to the lead characters of Narcos during his cameo, for which he travelled to Colombia's capital Bogota last week. During filming, the Instagram star had the chance to take some photos with the lead actor Pedro Pascal and other cast members. One of Gökçe's posts showed him sitting on a table while lead Narcos actors posed with his trademark "Salt Bae move" as if they were seasoning meat. The Instagram post with #saltbae, #saltlife and #narcos hashtags was immediately liked by thousands of Gökçe's followers. This is not the first time Gökçe has made the headlines with his Instagram posts, last February he was seen with Academy award winner Leonardo DiCaprio in the Dubai branch of his steakhouse chain Nus-ret. Restaurant owner Gökçe shared a photo of himself and DiCaprio at the table, in which he seasoned the Titanic star's meal himself with his famous move while being closely watched by DiCaprio. Gökçe, already an Instagram star in Turkey, went viral internationally in January thanks to his videos in which he chops and seasons meat in perhaps the most 'sensual' way possible. Each of his videos has gained millions of likes, while internet memes of Gökçe started circulating on various social media platforms. Gökçe has even inspired a new mobile game called "Salt Chef" developed by Perfect Tap Games DMCC.